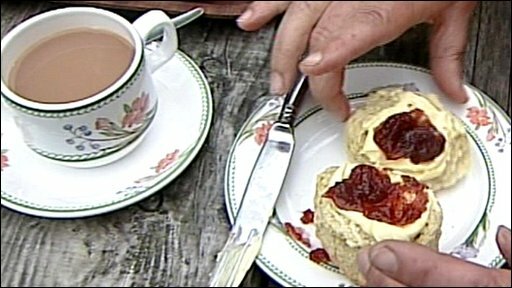 A campaign has been launched to get European protection for the name "Devon cream tea". Devon-based dairy Langage Farm says it is fed up with sub-standard versions of the cream and jam-laden scones and tea combination. Some so-called Devon cream teas have even been spotted abroad with cream dispensed from a can. Protected Designation of Origin (PDO) would mean teas must be produced, processed or prepared in Devon. The campaign, which has been launched following calls to BBC Radio Devon, started at the Devon County Show on Thursday with a petition to back the plan. The next step will be to win the backing of the Department for Food and Rural Affairs (Defra) to take the case for PDO status to the EU. If the Devon cream tea wins protected status, it will join cheeses including Stilton, Single Gloucester, Dovedale and Swaledale, and Cornish clotted cream and the Cornish sardine. Paul Winterton, general manager at Langage Farm, told BBC News: "I have seen Devon cream teas with cream from a can in the Lake District, the scone was like a cake. 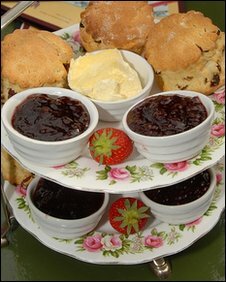 "With an excellent food like the Devon cream tea, you need to know its origin. Scone debate: Cream or jam first? "I feel people are being short-changed. "I don't think they can refuse us." But Mike Pearce of Cornishcream.com said: "There is only one cream tea, and that's the Cornish cream tea. "I don't think Devon has the got the status that Cornwall has got for any products." The divide extends to the way the cream tea is made in the two counties. In Devon the cream is used first followed by the jam, an essential part of the PDO application, said Mr Winterton. In Cornwall it is the other way around. Mr Winterton said: "I think the placement of the ingredients is important, to distinguish it from other cream teas." How do you do take your cream tea?